The Brilliant Leadership Brain of Dr. Martin Luther King, Jr.
Today I'd like to take you on a journey in the mind of the Honorable Dr. Martin Luther King, Jr.
You see, I believe he was a RIGHT-BRAINER. He was a dreamer, a visionary, and had unwavering faith in humanity. His imagination stole a glimpse of the future and he so graciously shared with us the secrets of a new day. He had a PURPOSE to serve, fueled by PASSION that started out as a VISION. The vision evolved and led his senses to gauge the climate of his time thus allowing him to unconsciously seek opportunities to PURSUE his vision effectively. The right brain is engineered to do these things. It receives signals of what is going on in the world using the 6 senses (touch, taste, hear, sight, smell, & intuition). The stimuli from these senses then gets integrated into the right brain to interpret those sensations as emotions. The right brain then creates pictures, visions, and possibilities and connects them with our subconscious minds and higher brain to reach for something BIGGER. It’s NOT the job of right-brain to figure out how these visions will come about. But the visions are enough to activate the brain regions that “think” it has already happened. This is similar to the mental rehearsal one does when “mentally” practicing her golf swing or piano piece. He was also a LEFT-Brainer…because he didn’t live permanently in the place of dreams…he did not leave his dreams up to “chance.” He went out and made things happen…in the battlefield, in the streets lined with INJUSTICE, amongst heated temperatures & temperaments, and within the midst of chaos, disorder and aggression. This is the function of the left-brain… to fill in the details of the vision. It analyzes incoming information, makes adjustments and calculates risks. It manages primal instincts, emotions and keeps us calm amongst the emotional storms. It works closely with the intellectual brain (prefrontal cortex-behind the forehead) to interpret emotions and think logically about how to ACT upon situations and people. 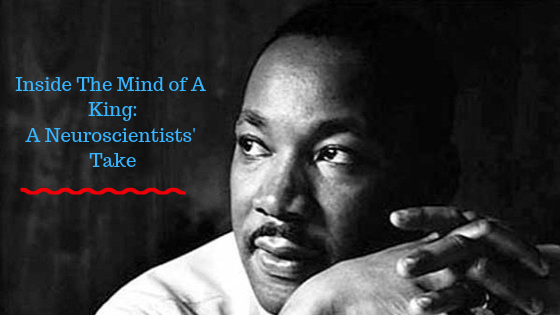 Dr. King led from ALL parts of his brain (instinctive brain, emotional brain, left/right brain, and intellectual brain) in a concerted, balanced way. This ability was ABSOLUTELY NECESSARY in order to lead a movement that advocated NON-violence. He had to manage his emotions, minimize instinctive behaviors, think analytically and lead others to do the same. He did not just lead others. He had to teach others how to manage their fears to be able to withstand very violent times. He trained them HOW to manage their instinctive brain so as to NOT “fight” back and channel their energy towards a higher purpose…a higher calling…by tapping into their higher brain functions. This is my calling and purpose. I am teaching people how to use ALL parts of their brains to find their purpose and reach their highest potential. Only then can we lead ourselves and others effectively, as well as effect change in the world. I am grateful for the lessons that I learned from Dr. Martin Luther King. My lessons may be different from your lessons but nonetheless, we can agree that he was a fearless leader that showed exceptional mind and brain abilities. So in addition to acknowledging the works of Dr. King, also understand how the brain connects to compassionate leadership so as to propel you forward towards your dream, your vision, and your cause using the principles of the greatest technology on the planet: YOUR BRAIN. P.S. Learning to see the world from the lens of neuroscience is a POWERFUL coaching and leadership tool. It will allow you to better understand and appreciate the contributions of others. I look forward to sharing more this year to fuel your mission to serve the world in your own way.